The Broda Elite chairs now offer a choice of either seat or base mounted arms. This new option allows the Elite models to offer even more versatility in positioning. The Broda Elite model 85V Tilt Chair, is designed for use by individuals who need support while sitting. It has a suspension system of straps that conform individually to the user's body, suspending the user's weight across multiple points. Residents requiring a fixed hip angle of 90° and/or those requiring tilt-in-space only, as opposed to tilt and recline. Residents requiring medium to heavy levels of nursing care. Residents who suffer medium to severe diagnosis. Residents with Huntington's, orSevere agitation and involuntary movement. 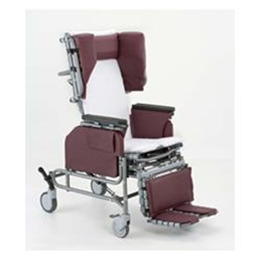 This tilt-in-space chair has up to 40° of infinitely adjustable seat tilt and makes containment issues and upper body positioning problems a thing of the past. Choice of seat or base mounted arms – NEW!